In the early seventies, the Mexican government decided it was time to include the air quality issues in their agenda. The United Nations Conference, celebrated in Stockholm in 1972, served as a framework for the new Mexican Legislation. In 1971 the first regulation on atmospheric pollution was published and soon after, the first Mexican Standards followed. But it was the crisis of the late 80´s in Mexico City that triggered the attention of the federal and local governments on air quality issues and therefore, the first Program on Air Quality for Mexico City (1990-1995) was created. It was also in 1995 when the Secretariat of the Environment and Natural Resources, SEMARNAT was conceived as the first Ministry of Environment in the history of the country. * The supervision and encouragement of programs, regulation control, and legislation in relation to environmental issues and in coordination with other federal, state, or municipal authorities. * The evaluation and assessment of the environmental impact from development projects presented by public and/or private parties. * Atmosphere quality control and the establishment and promotion of the Environmental Information System, including atmosphere monitoring. * Lead national policies on climate change and ozone layer protection. The programs to improve air quality are known as PROAIRE. They are one of the most important instruments developed to reduce the negative tendencies on air quality in the major cities nationwide. The programs use concrete measures for the control of pollutant emissions and are based on the relation of pollutant emissions sources and their impact on air quality and human health. Local and state authorities are fundamental for the development of these programs since it takes great effort to compile and analyze information for a diagnosis on air quality for each urban zone. After the diagnosis, a series of strategies, measurements, and actions are identified and evaluated. A work plan is developed and the primary stakeholders are identified. Normally PROAIREs are developed only for a certain period of time. During 1990 - 1996, Mexico City, Monterrey, Guadalajara, Toluca, Ciudad Juarez, Mexicali and Tijuana had a PROAIRE. As of January 2009 only Mexico City, Ciudad Jaurez, Toulca, Puebla, Salamanca, and Leon maintain PROAIREs, so a diagnosis could be obtained that will set the basis for the each program in these urban areas of the country. There are approximately 24 million people living in these six cities. Between 1995 and 2000 SEMARNAT, with support of the EPA, developed a methodology to compile emissions inventories that are adequate for the characteristics of the country. The inventories are determined based on estimations of all the pollutants emitted by the different sources such as, industries, vehicles, services, landfills, etc. The four primary sources of investigation are identical to the United State's categories, i.e. point, mobile, area, and natural sources. Mexico dictates that these four sources must be updated every three years. 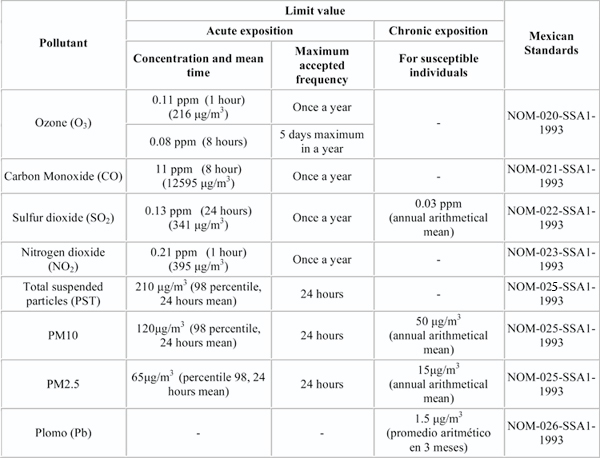 Within these categories, Mexico looks at criteria pollutants and precursors: CO, NOx, SO2, COV, PM10, PM2.5, and NH3. Mexico City is one of the cities in Mexico with a more complete knowledge of inventories. Every year Mexico City publishes four emission inventory reports for criteria pollutants and precursors, toxics, GHG, and solvents. They have also settled on using geographical data along with hour-by-hour emission records to support air quality modelling. One major necessity to appropriately evaluate air quality in a region or city is a reliable air quality monitoring system. Also between1995 - 2000, SEMARNAT supported, financially and technically, state’s and local authorities establishment of monitoring systems. At present, INE manages the National Information System on Air Quality (SINAICA). This system collects and publishes, through its web page, the data of the main air monitoring systems of the country. This system includes the air quality networks of 28 cities. INE promotes and coordinates research on environmental issues in order to provide data, innovative ideas and proposals, and generate technical input for decision making to support the environmental and natural resources management. *The “green ecology agenda” aims to carry out research that leads to the sustainable use of natural resources through the planning of ecological land use, biodiversity conservation, and the integrated management of basins. *The “gray ecology agenda” encompasses the pollution control measures at local, regional, and global scales. Its goal is to develop research intended to help design policies that prevent pollution and allow the proper management of hazardous materials. *The “socio-economic agenda” is made up of research projects geared toward designing new economic instruments of environmental policy, develop economic assessment methodologies for natural capital and environmental services, and establish environmental accounting systems. *The “experimental research and training agenda” includes research primarily with an experimental approach to control technologies, monitoring, and the characterization of pollutants, substances, and waste in all of the environmental matrixes. It also includes specialized development of human resources oriented to the study of environmental issues. These experimental research techniques are then taken to high quality laboratories and used to try and find better solutions to specific problems. When it comes to air quality, Mexico regulates with a number of instruments that allow prevention and control of atmospheric air pollution. Among these instruments is the General Ecological Equilibrium and Environmental Protection Law (LGEEPA), the Regulation on the Prevention and Control of Atmospheric Pollution and the National Standards on air quality. The most important regulatory instrument is the General Law, which applies at a national level and establishes the obligations of the federal and local authorities on environmental issues. Chapters I and II of this law include articles 109 BIS, 109 BIS 1, 110, 111, 111BIS, 112, 113, 114, 115, and 116 that cover air pollution prevention and control. LGEEPA also gives to the state the responsibility to set laws for environmental protection. The Regulation defines the technical and administrative procedures that the industries, under federal jurisdiction, must follow in order to comply with the law. It also establishes mechanisms like the Environmental License (LAU) that has to be obtained by industries in order to operate, and the Operational Annual Report (COA), which is a statement submitted annually by each industry in order to report their primary emissions and transfers of pollutants. Finally, a series of Official Mexican Norms were developed by SEMARNAT to regulate the emission of pollutants produced by mobile and point sources. These norms address the emissions of the most detrimental criteria pollutants and their aim is to protect human health and ecosystems by regulating air quality and establishing emission limits for pollutants. Air quality standards are based on public health and were published by the Secretariat of Health in December 1994, in coordination with SEMARNAT and representatives of the public sector, academia and environmental groups. The major goal of these standards is to protect human health, especially for those most susceptible to pollution like children, seniors, and those people with chronic respiratory problems. 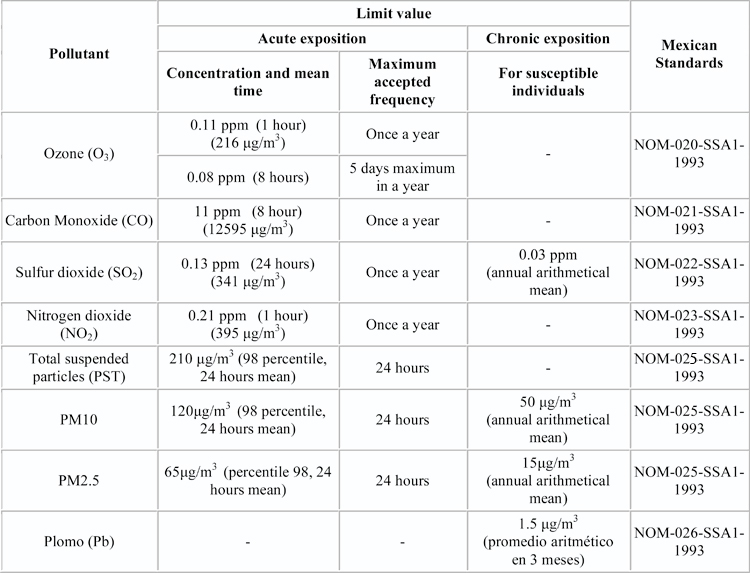 Table 3.7.13-1 below presents the standards for pollutants with the permitted limits of exposition. The General Attorney for the Protection of the Environment, PROFEPA, through its area of Industry Inspection, is in charge of supervising the implementation of the environmental regulations on air quality, hazardous waste, environmental impacts, risk, etc. In order to fulfill its duty, PROFEPA designs and applies inspection policies for industries and services under federal jurisdiction. In 1995, Mexican law expanded on the Official Mexican Norm, NOM-075-ECOL, which establishes maximum emission levels for volatile organic compounds. Among other measures laid out in this rule, it states that every refinery should control a minimum of 95% of the organic compound emissions by using either fixed or floating roof covers. Also, every refinery must inform SEMARNAT of any equipment failures and they must also state how must time it will take for the equipment to be repaired. SEMARNAT is responsible for enforcing this law through the Federal Environmental Protection Supervision (PROFEPA), who is responsible for performing inspections. Every breach of this law will be sanctioned under the General Ecological Equilibrium and Environmental Protection Law.